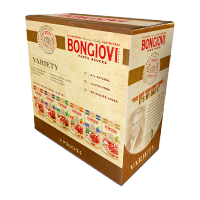 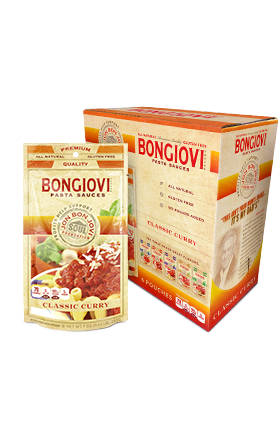 Bongiovi Brand Classic Curry pasta sauce is changing the way welook at pasta sauce. 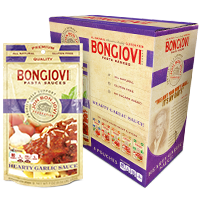 Enough spice to satisfy any Curry enthusiast and is a great all purpose sauce to use with chicken, seafood or pork. ITALIAN TOMATOES, ONIONS, EXTRA VIRGIN OLIVE OIL, GARLIC, BASIL, CRUSHED RED PEPPER, SALT,PARSLEY, PAPRIKA, TURMERIC, CUMIN, CORIANDER, GROUND MUSTARD SEED, RED PEPPER, FENNEL SEED, GROUND CARDAMOM, CINNAMON, CLOVES.